Immortality is something all of us have thought of, but nobody really takes seriously. A 31-year-old Russian man named Dmitry Itskov wants you to seriously consider the possibility of living forever, and perhaps even plan on being able to do so by 2045. His plan, called simply "The 2045 Initiative," will sound familiar if you've seen the James Camera blockbuster "Avatar" — and he just needs a few billion dollars to make it a reality. Itskov's project has several phases, with each step bringing mankind closer to the ultimate goal living forever. The first step in the project is to create robotic humans that can be controlled remotely. He plans on crossing this hurdle by 2020 at the latest. Then, by 2025, a human brain will be transferred into a robotic skeleton to continue life after death. 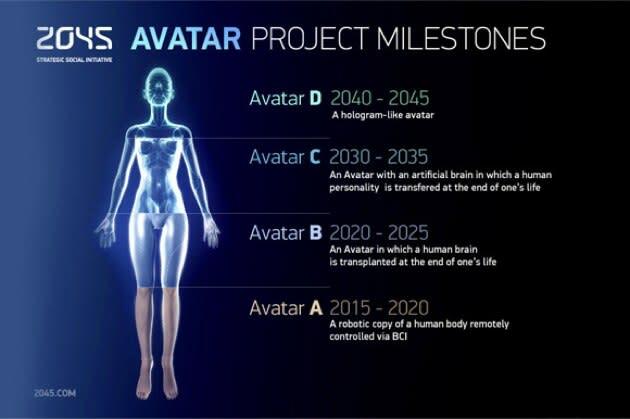 By 2035, the avatar's brain will be constructed separately, and your own personality will simply be "transferred" into it when you are ready to end your human existence. And finally, by the year 2045, humans will be able to walk around in holographic avatars for eternity, never fearing death. Not surprisingly, the Avatar project is extremely expensive, and Itskov needs some serious financial help if he's to pull it off. So, naturally, he's asking the world's richest people to help fund the movement. In return, he's pledging to help each donor on his or her own immortality quest. You know, because you just can't spend $50 billion in one lifetime. The War on Aging: Could buckyballs let us live to 150?